God’s own Country – Day 4 – NH 212 – Wild encounters at Bandipur ! | Highway - the only way ! 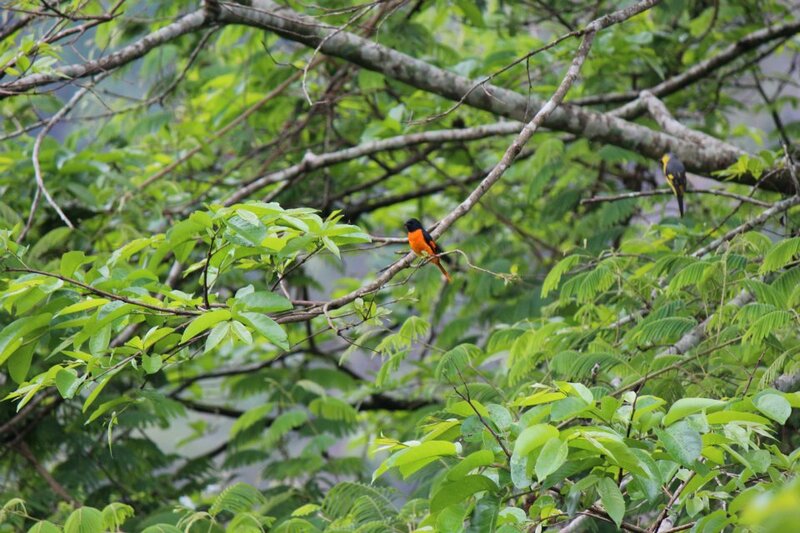 God’s own Country – Day 4 – NH 212 – Wild encounters at Bandipur ! 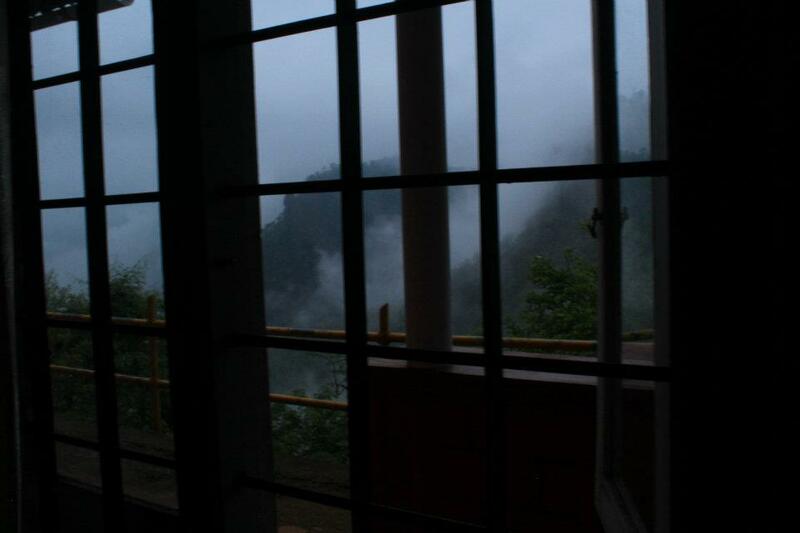 This writer always had a wish, to wake up to a view of waterfalls and mountains from a window on the bedside, how idyllic ! Bleary eyes woke up to this eye-popping view, it was exactly how this writer had imagined. When you are in God’s own Country, expect your wishes and dreams to come true ! Good food, great locales is all you need ! Day 4 was the penultimate day of our trip and we were starting back on our 900 km journey back home, spread over two days. The plan for day 4 was to start from Wayanad, stop for the night at Mandya near Mysore and resume the journey the next day. The idea was to have a relaxed drive instead of racing to reach Hyderabad in one day. We also had a thought of driving to Mysore via Ooty but gave it up because it would be hectic and the driver of Figo 1 wasn’t keeping too well. 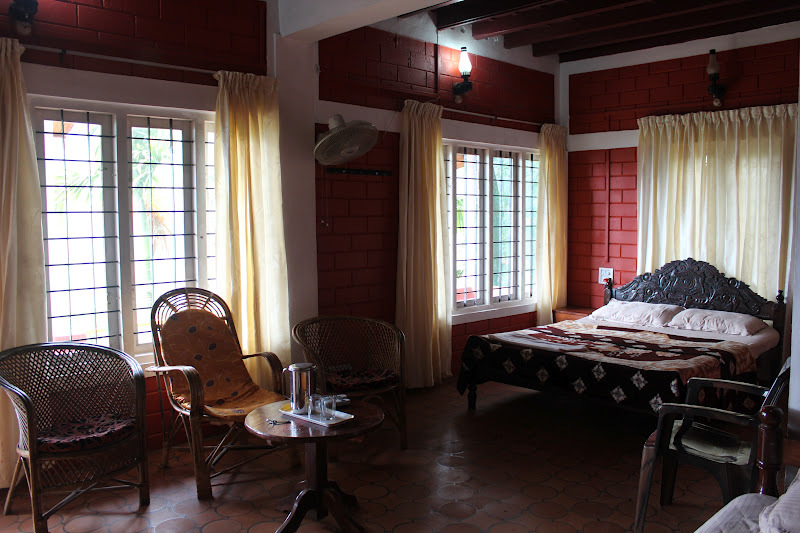 The previous day, we booked accommodation at Hotel Haripriya at Mandya to break for the night. 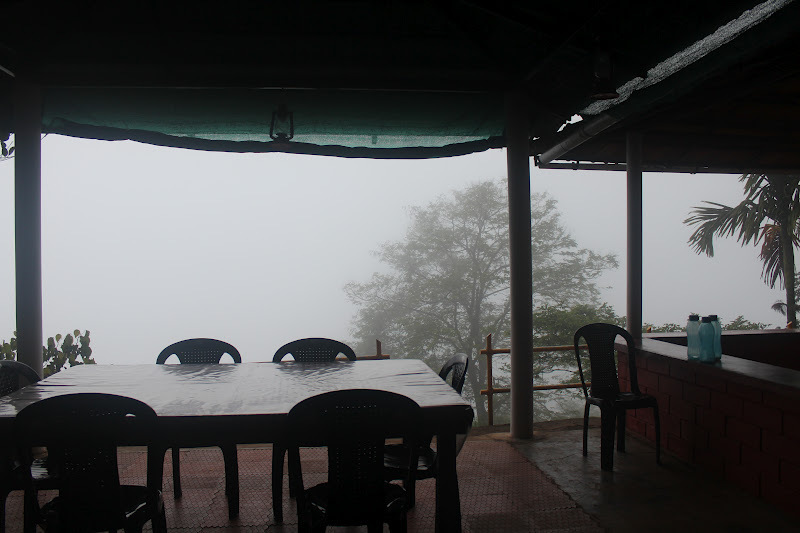 Wayanad has good mobile signals and we browsed for hotels online, we hadn’t made plans earlier because we left the last two days open. Wireless/mobile internet is a blessing when you are traveling. After cups of “instant-filter” coffee, we sat down for breakfast of Appams, coconut chutney and chole curry. Boy, did we binge on the appams or what?? They had initially served around 20 appams for 6 of us, when we were finally licking our fingers, the appam count went upto 32 ! Mr.Joby must have got the shock of his life ! One can’t blame us either, when the food is as tasty as that, foodies like us are helpless ! It was a white morning with the clouds covering up the place most of the time. For two days, we had seen the clouds everywhere but never grew tired of watching them floating by as if in a ballet dance. This one looks straight out of a fantasy movie set, doesn’t it? No visual effects needed here. 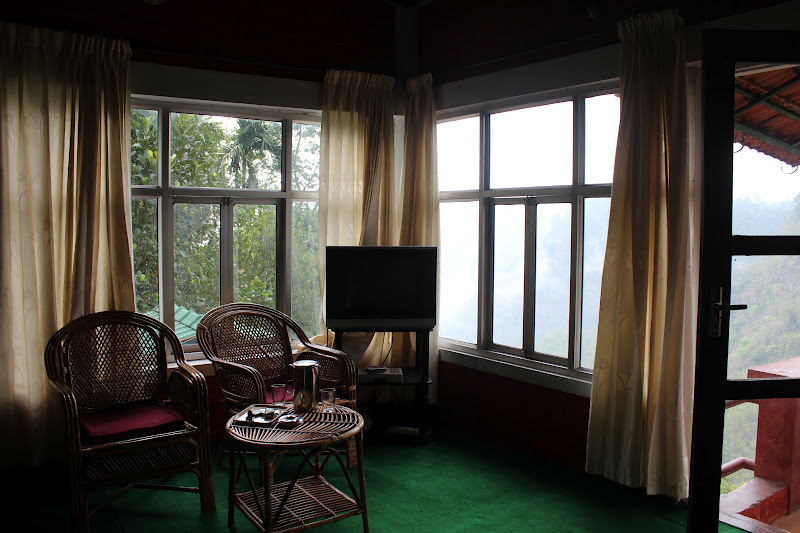 We literally put our feet up in the quiet freshness of the morning and watched the birds. The birds decided to show off and birds of different colours masqueraded before us one after the other. Ever heard of birds of different feathers flocking together? Some had such striking colours, bright yellow, red, blue, this one was florescent orange ! Soon, it was time to go. The homestay was expecting the next set of guests in an hour and we quickly packed up. Mr.Joby and Mr.Jenoy, were very kind to let us keep our booty of fruits and take them back with us. 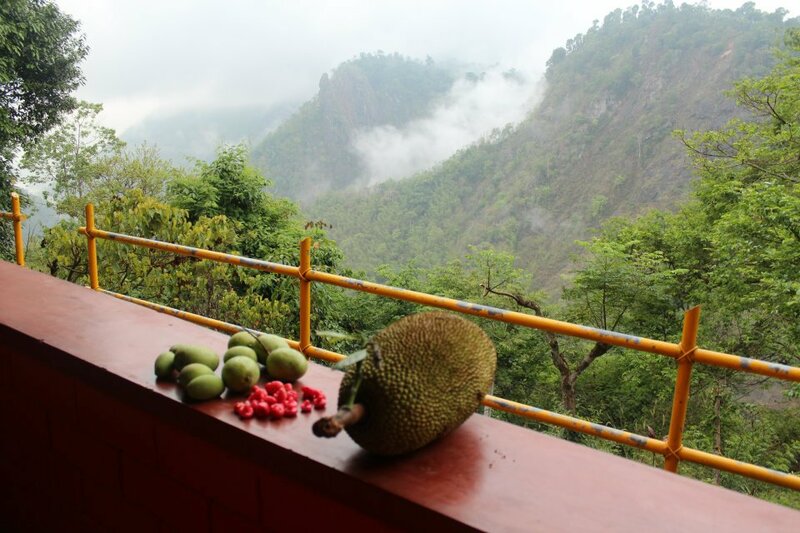 Our booty consisted of a mangoes, berries and 2 jackfruits, one of them was so big that two people had to carry it back to the car ! We clicked pictures of the homestay and promised Mr.Jenoy that we would promote his homestay back in Hyderabad. Such a lovely place ! View of the room on the top floor. The ground floor room. Each room can accommodate 4 people. 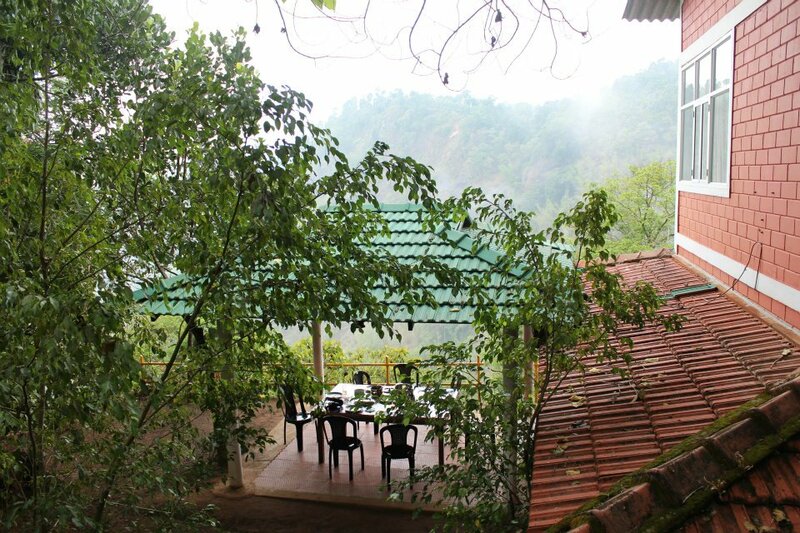 It cost us around Rs.10000/- for 6 people for 2 nights, excluding food. Food cost was roughly Rs.150 per person per meal, nothing compared to the loss Mr.Jenoy must have incurred on feeding 6 ravenous foodies ! It worked out very economical for us. The rates might be higher post monsoon when it is the peak tourist season in Kerala. It also helps if you know the local language so that you can bargain better, our colleague had helped us when we were making the reservation. Whatever the cost, Valley View Avenue is worth every rupee you spend. We waved a goodbye to our little chatter box, the waterfall, which hid itself behind to clouds (we imagined it was sorry to see us go!). It was almost 11.00 AM when we were back where we belonged – on the road ! Since we had lot of time on hand, we decided to check out Edakkal Caves only to reach the place and realise that the site was closed, 1st May being Labour Day and a public holiday ! Then we saw a few sign boards to various places, Phantom Rock, it said was 2 kms from where we stood. When we reached the place where it said Phantom Rock, we were bewildered to find nothing there. There was a hillock which seemed like a quarry and a rock stood in the middle, that was it. We didn’t know what to make out of it and tried our best to find something remotely close to phantom, we even looked up for meanings of phantom to see if we could make out anything ! Deciding that we were either at the wrong place or the sign board was lying, we put an end to our sight-seeing and carried on with the journey. We took the same route back, stopping by at Sultan Bathery to buy the famous Kerala chips only to find them much more expensive than what we got in Hyderabad, they were also being served with compliments in the form of dead flies, which made us flea from the place ! By 1.00 PM, we were crossing the Kerala border. 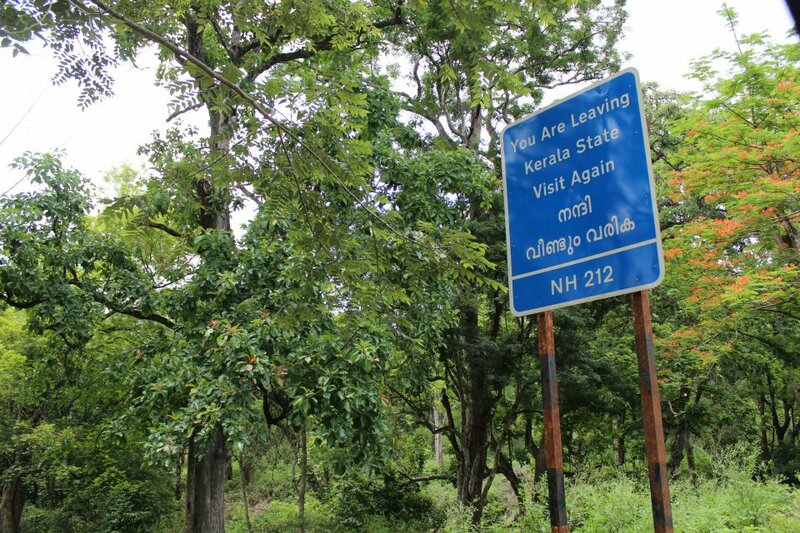 This writer sulked because the car was too fast to take a picture of the sign board on the border and the poor driver had to drive back 2 kms so that we could take a picture and to save himself from a life long regret ! Don’t we all have a fancy for such sign boards? From here, we entered the Bandipur National Park area. We were driving through hoping to spot some wild animals and a few kilometers down the road, bingo, we spotted some wild elephants ! There were two elephant calves grazing in the bamboo woods. We were very excited but careful not to disturb them, we quickly clicked some pictures and got back into the car. Even in that short time, the elephants seemed disturbed by the attention. 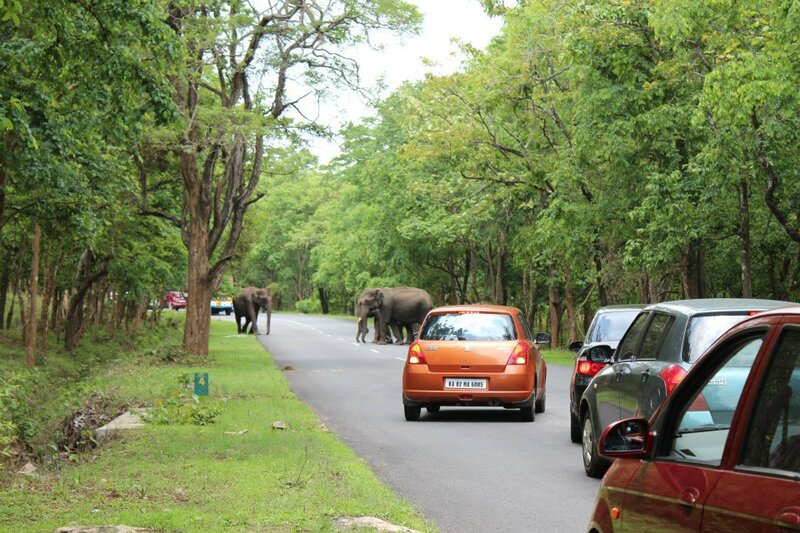 We also regretted having stopped because cars behind us began to stop and create a nuisance to the elephants. 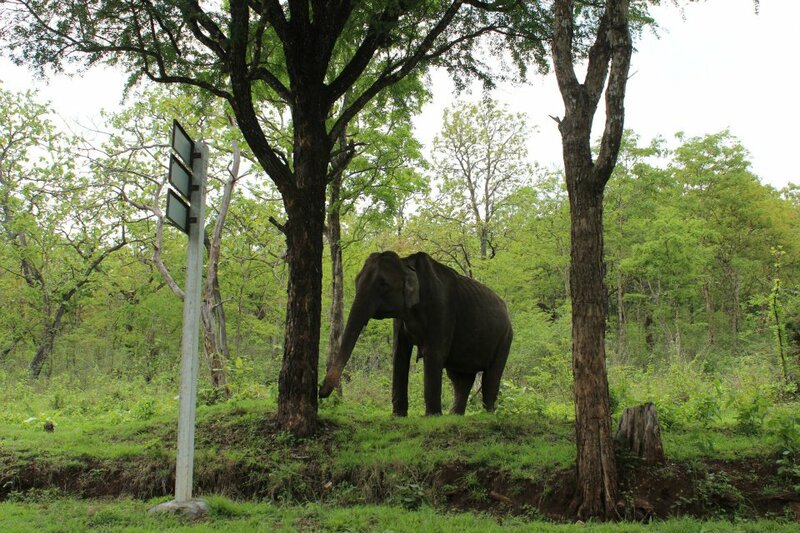 Further down, we spotted another elephant, right next to the Karnataka Tourism sign board, very close to the road. The poor thing was very old and weak, it was so thin that you could see its bones, it had such a pitiful look that it tugged at our hearts. Standing next to the Tourism board, it looked like a perfect ambassador of Karnataka Tourism. A car stopped by and told us that there was a herd of elephants on the road ahead. 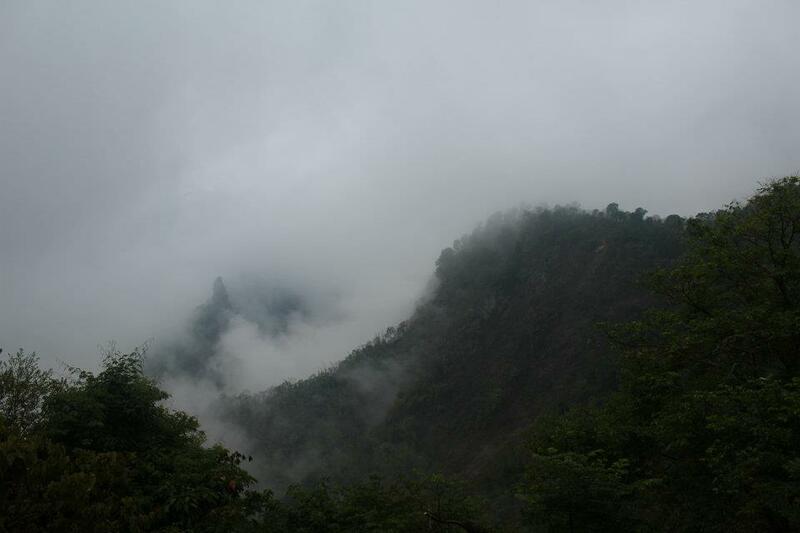 When we reached there, this is what we saw. 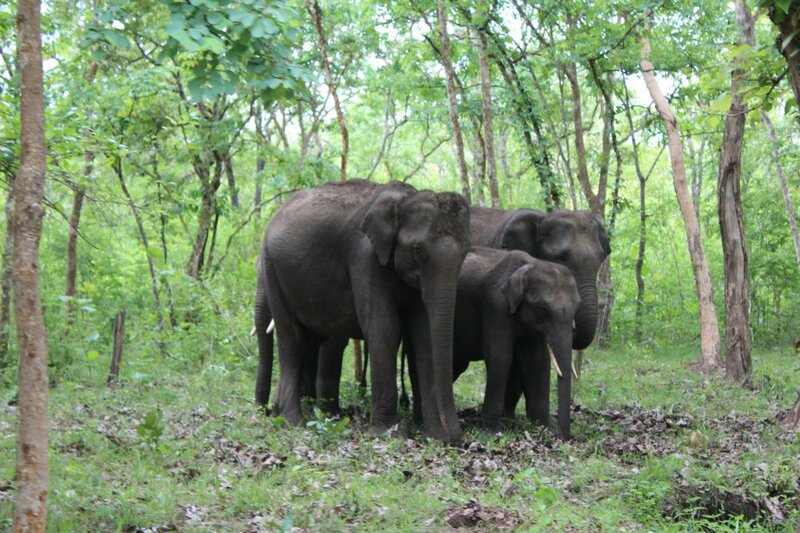 5 baby elephants were stranded on the road, unable to make their way across the road on their way back into the forest. One of them was a cute, little tusker. The little ones seemed scared by the cars, lorries and buses. They huddled together and trumpeted out of fear and seemed unable to decide which side to go. The orange car in the above picture did a foolish thing of reversing and its music frightened them more. It was heart breaking to seem them so lost and scared. Some hooligans on a bike, raced past shouting loudly and mocking them. The bigger calf was enraged and chased those fellows who ran for their lives ! We cheered for the elephant as it tried to protect its siblings. Finally, one of the bigger calves, went across the road and guided the little ones safely back into the forest and we heaved a sigh of relief. The traffic moved on. But, there was more. 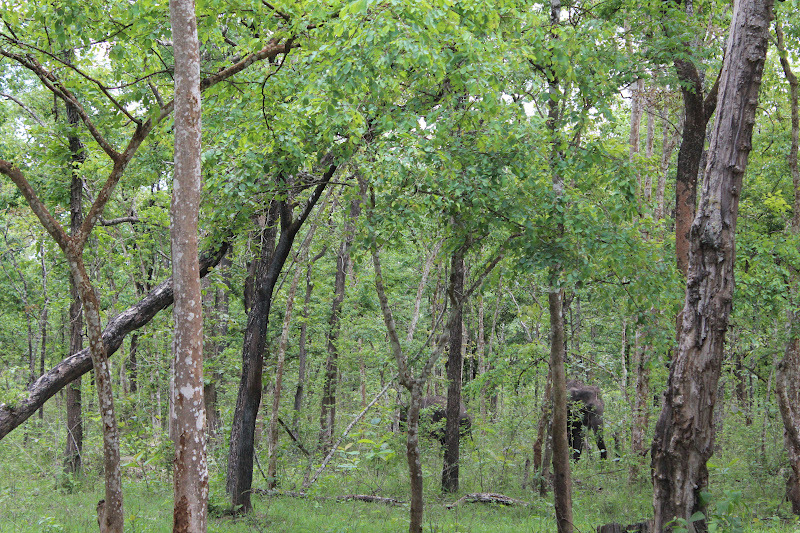 These little elephants stood in the woods bordering the road, trying to find some food. We very quietly stopped to take pictures and even switched off our car engines because the noise was scaring them. We were silently admiring as they went about their work. And then, the morons came back to disturb them, again shouting and honking loudly. The little tusker was literally shivering with fear as the bigger ones huddled closer to protect it. It was the most moving sight ever, almost reduced us to tears. The poor things were not safe even in their home. What kind of sadistic pleasure is it to scare innocent animals? It is their territory and we humans have no business there, yet because we are the “higher” beings, we intrude their living space and make life difficult for them. How human is that? Humans are supposed to be different from wild animals because of our ability to think but as we saw the love the calves had for one another and how they stood up for the little ones in comparison to the behaviour of our fellow men, we wondered who the wild animal was ! At that moment we felt that instead of all the animals that are endangered and going extinct, man deserves extinction so that the other living beings can live in peace. Of all the animals that exist on earth, man is the wildest ! For the next 15 – 20 minutes, we were very quiet, the scene kept playing in our minds. We stopped by for lunch somewhere on the highway enroute Mysore around 3.00 PM. By 4.30 PM, we reached Mysore. 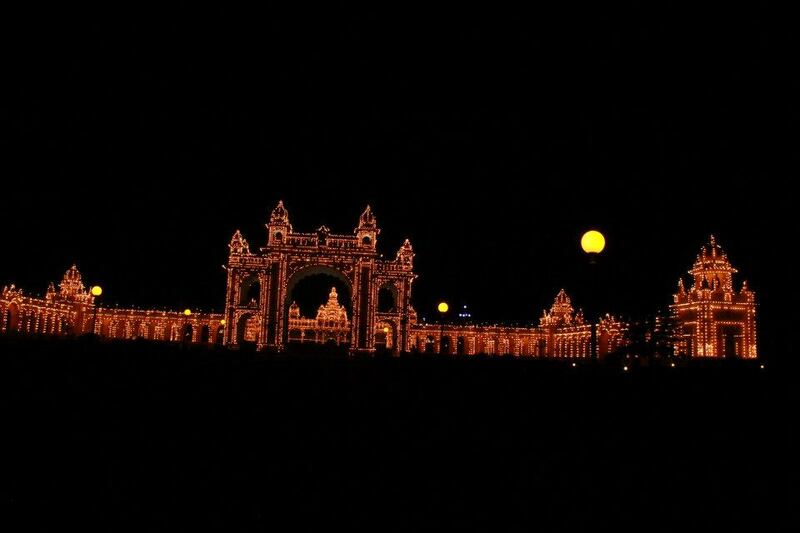 We still had lot of time and decided to first visit the Chamundi Hill and then the Mysore Palace to see the lighting because it was a public holiday and Mysore Palace is lit on weekends and public holidays. After a quick visit to the Chamundi Temple and losing our way in Mysore, going around in circles for half an hour, we found the Mysore Palace. An “achievement” because, the Palace is located on the main road, in the heart of the city ! 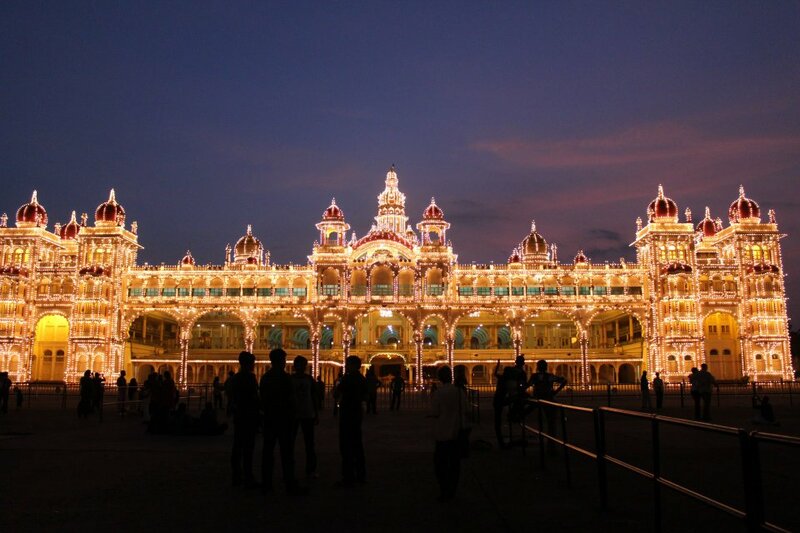 The Mysore Palace lighting is a must see event. The lights go up after sunset and the time varies depending on the season, in summer it is usually around 7 PM. The Palaces closes by 5.30 PM, so we waited at the Palace grounds from where one can view the lighting, the entry is free. By 6.30 PM the sun began to set, it was quite a sight to see the imposing Palace with sky at dusk as the background. At 7 PM exactly, the entire Palace was lit up. It was the second time in 4 months that this writer was witnessing the event, yet, the moment the lakhs of bulbs are switched on, all in just one second, it is ever thrilling, it makes you go “WOW” with a capital “W” every time. One can practice photography skills by clicking the bedecked Palace, you don’t see such a dazzling sight every day ! It was only 7.30 PM, so we decided to have an early dinner at a nearby restaurant. For some queer reason, the water in the washrooms was boiling hot, we came out with burnt hands ! The food was good, though. We reached Mandya, 45 kms from Mysore on the Mysore-Bangalore highway by 9 PM and checked into Hotel Haripriya. We chose to stay at Mandya for the night because though Bangalore or Mysore was a strategic halt, both the cities was far too expensive, especially for a transit. An ordinary room in Mandya cost only Rs.450/-. Hotel Haripriya seemed to be the most popular hotel in the area, there was a wedding going on in the hotel and it was very crowded, finding a parking space was a big task. Also, the hotel guys were inhospitable with their rather indifferent attitude, they had even messed up our booking. We let it be because we were staying there only for a few hours. We crashed almost immediately to wake up early for the long drive ahead the next day.